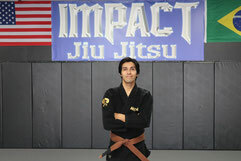 Richard Rangel is a Jiu Jitsu 1st degree black belt and the owner/head instructor at the Hillsboro academy. Richard received his black belt from Professor Michael Chapman in April of 2013 and had already been teaching the art of Jiu Jitsu as a purple belt since 2009. Since then Richard has taught Jiu Jitsu and athletic conditioning at Portland Community College, Rock Creek and Sylvania campuses, as well as Impact Beaverton and Impact Gladstone. Richard also has a degree in the exercise and fitness industry and enjoys the competition side of Jiu Jitsu as well as the practical self defense aspect. His hobbies include kickboxing, hiking, travelling the world and watching Jiu Jitsu videos. Ericson Abalos has been a very influential member of the Hillsboro academy since his arrival in 2014. Having experience in striking as well as a well-rounded ground game, Ericson has studied the sport of Kickboxing and Muay Thai since 2003. He currently has an MMA record of 5 wins with only 2 losses. He is holding a Brown belt in Jiu Jitsu and his coaching style is very detail oriented and easy to follow. Ericson has coached a variety of classes in the area to include jiu jitsu, boxing, kickboxing, MMA fitness and conditioning. His hobbies include hiking, swimming, and, of course being from Hawai’i, surfing. Greg began his Jiu Jitsu journey in the fall of 2016 in Lahore, Pakistan, where he trained until joining the Impact Hillsboro family in June of 2017. His coaching style is very athlete centered, and his focus is on the development of the entire athlete. In January of 2012, he received a teaching certificate for K-12 Physical Education, and in June of 2017, received his Masters of Sports Coaching from the University of Northern Colorado. Along with being an active competitor in Jiu Jitsu, Greg holds a black belt in Tae Kwon Do, and trains boxing and kick boxing. Outside of martial arts, Greg’s hobbies include lacrosse, camping, and traveling. Nathan Bonilla has been studying Brazilian Jiu Jitsu for 6 years, and began his training under Richard Rangel at PCC Rock Creek. His favorite thing about Jiu Jitsu is that it exercises the mind and body simultaneously, making it a fun way to exercise and keep the mind sharp. Aside from Brazilian Jiu Jitsu, he has an academic background in Psychology. When Nathan is not practicing Jiu Jitsu he is most likely hiking, camping, star gazing, or going on photography trips. Above all Nathan’s goal as an instructor is to make sure that every student realizes their true potential, developing meaningful characteristics which empowers students on and off the mats.